Sethusamudram, a project to create alternative shorter route for ships to cross the Gulf of Mannar, is a wonderful idea -- one which is more than 150 years old. The channel, originally an idea of a British commander named A D Taylor was put forth in 1860. In 1955, the Government of India set up the Sethusamudram project committee to look into the feasibility of the project and five routes were discussed till 2001 but nothing happened. The National Democratic Alliance government sanctioned a few crore rupees to study the project but before a final decision on the route could be taken, the government lost power. The official web site of the project says, 'Ships originating from the west of India and destined for Chennai, Ennore, Vishakapatnam, Paradeep, Haldia and Kolkata have to travel around the Sri Lankan coast resulting in increase of travel distance and time. Apart from this ships belonging to Indian Navy and Coast Guard need also to traverse around Sri Lanka. In order to reduce the steaming distances between the east and west coast of India and to improve the navigation within territorial waters of India, a navigation channel connecting the Gulf of Mannar and Palk Bay through Adam's Bridge has been envisaged so that the ships moving between the east and west coasts of India need not go around Sri Lanka.' The total cost of the project is Rs 2,427 crores (Rs 24.27 billion). But due to political expediency and a pathetic problem of a 'secular amnesia' about heritage matters, it has got a controversial hue, which could have been avoided if some transparency was maintained and points of collective sensitivities and faith were not ignored. The project is fine, but the present route is not, as it involves destruction of a bridge believed to have been built by Lord Rama and Muslims and Christians believe it to be Adam's creation. Foreigners and Indians alike have described it as Rama's bridge since ancient times in their maps and travelogues. The first time someone called it Adam's Bridge was in 1804 by James Rennell, the first surveyor general of the East India Company. Even if the Government of India prefers to use the name Adam's Bridge, it simply proves that not only Hindus but Muslims and Christians too have a reverence for the bridge it is going to destroy. 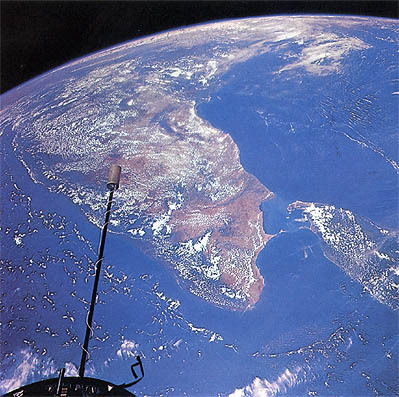 The Ram Setu or Adam's Bridge connects India's Rameshwaram to Sri Lanka's Talaimannar. A movement has begun to safeguard it at the shores of Rameshwaram on April 18. Two former judges of the Supreme Court, Justice K T Thomas and Justice V R Krishna Iyer, none of them close to the saffron side, have warned the government against destroying the Ram Setu. It is ironical that a government which changes the metro rail route to protect the Qutub Minar, built with the material of destroyed temples, stops a corridor to protect the Taj Mahal's surroundings and spends crores of rupees to showcase ancient potteries and jewellery in heavily guarded museums, is destroying a unique symbol of national identity and an icon well preserved in our minds since ages. Even a child knows that a bridge was built by the friends of Lord Rama using floating stones and Rama's army marched over it to Lanka to rescue Sita and destroy the evil regime of Ravana. Hence during Dussehra every year and in dance dramas depicting Rama's life enacted across the globe, specially in East Asia, they never ever fail to mention the Setu Bandhan or the construction of Rama's bridge. Apart from the Ramayana, the Mahabharata also refers to the continued protection of Nala Setu following Sri Rama's command. Kalidasa's Raghuvamsham also refers to the Setu. So does the Skanda Purana (III 1.2.1-114), the Vishnu Purana (IV 4.40-49), the Agni Purana (V-XI), the Brahma Purana (138.1-40). That is the memory so beautifully adopted by the Geological Survey of India in its logo, which describes India in this line etched at the bottom of its insignia -- Aasetu Himachal, meaning India is spread between the Bridge and the Himalayas. That is the Ram Setu Bridge on the southern tip of our motherland, an identity of the nation, under destruction now. The credit of digging up material regarding the Ram Setu and providing impeccable factual content goes to Kalyan Raman, a former senior executive of the Asian Development Bank. He astounded even the government with his material on the entire project. His findings have stirred up protests from the Rashtriya Swayamsevak Sangh, the Vishwa Hindu Parishad, the Bharatiya Janata Party and the Hindu Dharma Acharya Sabha. Ashok Singhal of the VHP is spearheading a movement to protect the Ram Setu. He addressed a big public meeting in Rameshwaram with religious heads and Dr Subramanian Swamy. BJP leader and former Union human resources development minister Dr Murli Manohar Joshi has written to the prime minister, urging him to stop the destruction of the great heritage site. Apart from such issues of heritage and belief, there are genuine concerns regarding security and the tsunamis' impact increasing in case the Ram Setu is destroyed. If the new channel is created through the present Rama's bridge, international ships would pass through it making a de facto international boundary between India and Sri Lanka, facilitating an increased alien presence, burdening our navy to a great extent. So far the sea between India and Sri Lanka has been recognised as historic waters, though the United States has been pressurising to have it declared as international waters and said in a naval notification in 2005 that it does not accept the sea between India and Sri Lanka as 'historic'. The US declaration and the role of the Tuticorin Port Trust, the nodal agency to implement the Sethu Samudram Canal Project coupled with the haste with which the project was inaugurated, has given rise to many unanswered questions. The US Navy operational directive refusing to accept the sea between India and Sri Lanka as 'historic' was made on June 23, 2005. The Prime Minister's Office sent some queries in March 2005 to N K Raghupathy, chief of the Tuticorin Port Trust. He sent answers to the PMO's queries on June 30, 2005 and Prime Minister Manmohan Singh with United Progressive Alliance Chairperson Sonia Gandhi inaugurated the project on July 2, 2005. Why were the queries sent to the TPT and not to an agency which had scientific authority to look into the geological and maritime aspects of the project? Why did the prime minister and the UPA chairperson rush to inaugurate the project without, prima facie, having the time to look into the answers given by the TPT chief? Why was the present route okayed which essentially requires the destruction of the Ram Setu, while other options, closer to Dhanushkodi, which did not touch the Ram Setu were ignored? Local fishermen, Hindus, Muslims and Christians alike oppose the present route and are demanding alternative channels, which are available. They say the present channel would destroy marine life and corals. This will kill the trade in shankas (shells) that has a turnover in excess of Rs 150 crore (Rs 1.5 billion) per annum. Invaluable thorium deposits would be affected, which are too important for our nuclear fuel requirements. The issue concerns us all, and should be taken up as Indians, without getting entangled in party lines and political games. The Ram Setu or Adam's Bridge belongs to all humanity, being an important heritage site; hence the government should not allow it to become another issue affecting Hindu sensitivities. Nobody is opposing the Sethu Samudram Project, only a realignment of the route is being asked, as the present one destroys the Ram Setu. Tarun Vijay is Editor, Panchjanya, the Rashtriya Swayamsevak Sangh's Hindi weekly.